A Rimfire (also called small bore) Silhouette Match consists of shooting a total of 40 steel silhouette targets, at various distances, while standing using a scoped rimfire rifle. Typically rifles used are either bolt-action or semi-auto. It is very helpful to have your rifle sighting info for 40, 60, 77 and 100 meters prior to the match. Sighting shots are not allowed during the match; however, typically a 30 minute sighting-in period is offered prior to the match. The match at SLSC is an unofficial match run in accordance with the NRA Rifle Silhouette rules. A beautiful Easter Sunday afternoon brought out seven shooters to try their hand at the inaugural Sanners Easter Egg Silhouette match! 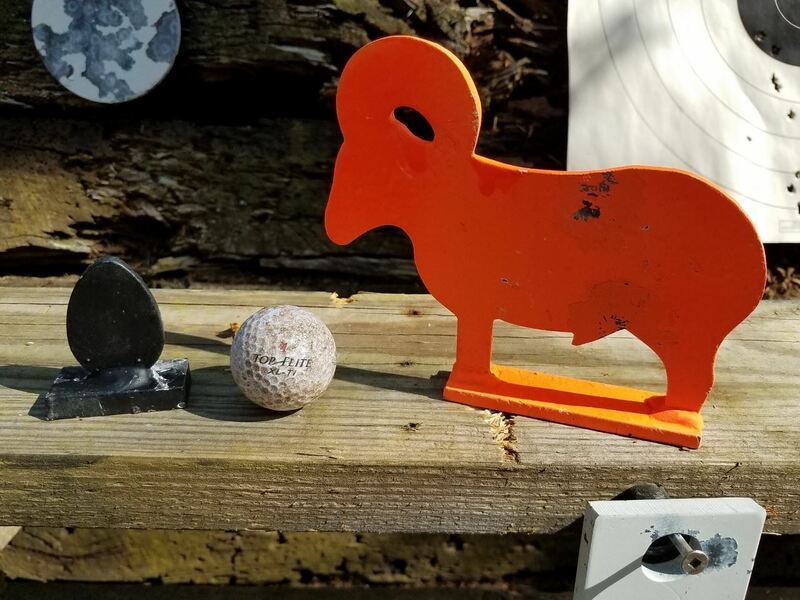 Instead of the usual metallic animal targets at 40, 60, 77, and 100 meters, we aimed at much smaller egg-shaped silhouette targets (about 1.4” wide by 1 .75” tall) at the same distances but off the bench. No special equipment allowed, either...we had to use the regular Sanners rifle range rests and sandbags. After giving everybody plenty of time to sight in their rifle at the different distances, the clock was started and the egg roll was on! It was a tight race for the top with only 8 eggs separating the top four shooters...but when the yolk settled it was Mark S on top with 37 eggs tossed off their stands. Breaking some eggs right behind him in second place was Jake S with 35 hits, while Jason M cracked the top three with eggzactly 32 hits. Not rolling over easy were Dean and Carrie Lee, with Dean shooting the first relay and then egging on Carrie Lee in the second, only to have an eggstatic Carrie poach the coach to take 4th place while Dean shelled out some shells to take 5th! Rounding out the hard boiled shooters was Tom V who scrambled to overcome a goose egg at 100 meters to nab 6th place. Not to be underdone, Terry W vowed to return and bring his scores sunny side up! See all of the eggzellent scores in the match report. Thanks to everybody for coming out, shooting the match, and helping with setup and teardown. Given how much fun everybody had during this match, we’ll plan to do a few more egg matches this year amongst the regular silhouette matches. Stay tuned for more info! *Note - "In a Row" pins are given for a complete bank - crossing banks for 5 in a row does not count. A relay of 4 shooters shoot the course of fire for their respective targets/distance then rotate to the next station and repeat until all four stations have been completed. More details are in the Course of Fire below. OPEN TO THE PUBLIC – all ages, under 18 with an adult. All skill levels are welcome but note that a sighted in rifle makes for a much more enjoyable match. Match begins at 1PM. Someone will be at the gate at 12:30PM to let in non-members. Targets are shot in order and no extra shots are allowed. A string (5 targets) is allowed 2 mins 30 sec to complete. Minimum of 30 seconds between strings. After the 10 targets at the current distance have been shot, the shooters will rotate to the next distance and repeat until all four distances have been completed. No sighting shots are permitted during the match. A target knocked over counts as one point with a maximum of 40 points per match. A turned target does not count for score it must fall.